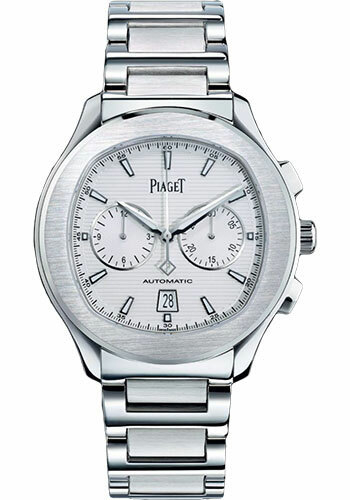 42 mm stainless steel cushion shaped case, 11.2 mm thick, transparent sapphire crystal back, silvered horizontal guilloché dial with baton luminescent index hour markers, Manufacture Piaget 1160P automatic movement with date at 6 o'clock, chronograph with central seconds, hours, minutes, minutes counter at 3 o'clock (30 minutes), 12 hours counter at 9 o'clock, approximately 50 hours of power reserve, polished and satin-brushed stainless steel bracelet, folding buckle. Water resistant to 10 atm. 42 mm stainless steel cushion shaped case, 11.2 mm thick, transparent sapphire crystal back, blue horizontal guilloché dial with baton luminescent index hour markers, Manufacture Piaget 1160P automatic movement with date at 6 o'clock, chronograph with central seconds, hours, minutes, minutes counter at 3 o'clock (30 minutes), 12 hours counter at 9 o'clock, approximately 50 hours of power reserve, polished and satin-brushed stainless steel bracelet, folding buckle. Water resistant to 10 atm. 42 mm stainless steel case, 11.2 mm thick, sapphire back, black guilloché dial with baton hour markers, 1160P automatic mechanical movement with date at 6 o'clock, chronograph with central seconds, hours, minutes, minutes counter at 3 o'clock (30 minutes), 12 hours counter at 9 o'clock, approximately 50 hours of power reserve, black leather and rubber strap, ardillon buckle. Water resistant to 10 atm. 42 mm stainless steel case, 11.2 mm thick, sapphire back, gray dial with baton hour markers, 1160P automatic mechanical movement with date at 6 o'clock, chronograph with central seconds, hours, minutes, minutes counter at 3 o'clock (30 minutes), 12 hours counter at 9 o'clock, approximately 50 hours of power reserve, steel bracelet, folding buckle. Water resistant to 10 atm. 42 mm stainless steel case, 11.2 mm thick, sapphire back, blue guilloché dial with steel Dauphine hands and a red tiped trotteuse hand, 1160P automatic mechanical movement with date at 6 o'clock, chronograph with central seconds, hours, minutes, minutes counter at 3 o'clock (30 minutes), 12 hours counter at 9 o'clock, approximately 50 hours of power reserve, blue alligator strap, folding buckle. Water resistant to 10 atm.